We crossed the 60th parallel yesterday and with it the seascape began to change. The huge waves that we battled in the screeching 50’s faded into smaller long distance swells that would remind us of what is waiting for us when we attempt to return northward on our way back after we finish drilling. The ocean continued to cool and with it created thick fog that would obscure our way as we plodded through these icy waters toward our first drilling site. When we started our shift at midnight, the inky night was further obscured by the icy fog that the vessel slowly made its way through. It made our journey to this icy remote continent even more mysterious and forbidding. Even with the break of day, which started progressively earlier owing to our climb to ever higher latitudes. The seascape was a blank with a low gray ceiling that our derrick would pierce drawing down to merge with the sea that taken on the same color. The result was that the horizon disappeared and where it should be was replaced with a gray that no eye could gaze through. I would only see an occasional large wave rise up relatively close by creating a momentary horizon only to be quickly replaced by this merging of sea and sky. When the fog finally lifted, we were greeted with the appearance of icebergs that came from seemingly out of nowhere and now created a flotilla of towering icy mountains that we would pass (at a healthy safe distance mind you), only to have new icebergs appear on the horizon. These juggernauts of iridescent blue, once were part of vast ice sheets that covers 98 percent of the Antarctica. They began their journey high up on the plateaus of this white continent as fragile snowflakes gently falling from the sky (which originally came from moisture from the ocean), but were transformed from the unrelenting pressure from the snow above into a solid mass so hard and forceful that it has scraped and eroded all soil and much rock from this once lush continent. It is strange that what once was such a soft powdery substance became this unstoppable mass of harden blue crystals. With unrelenting forces beset by gravity, the ice has continuously scraped and scorned the rocks by their weight and movement, with the inexorable desire of only getting down to the sea, where once achieving this goal, will perish like a moth to a flame. 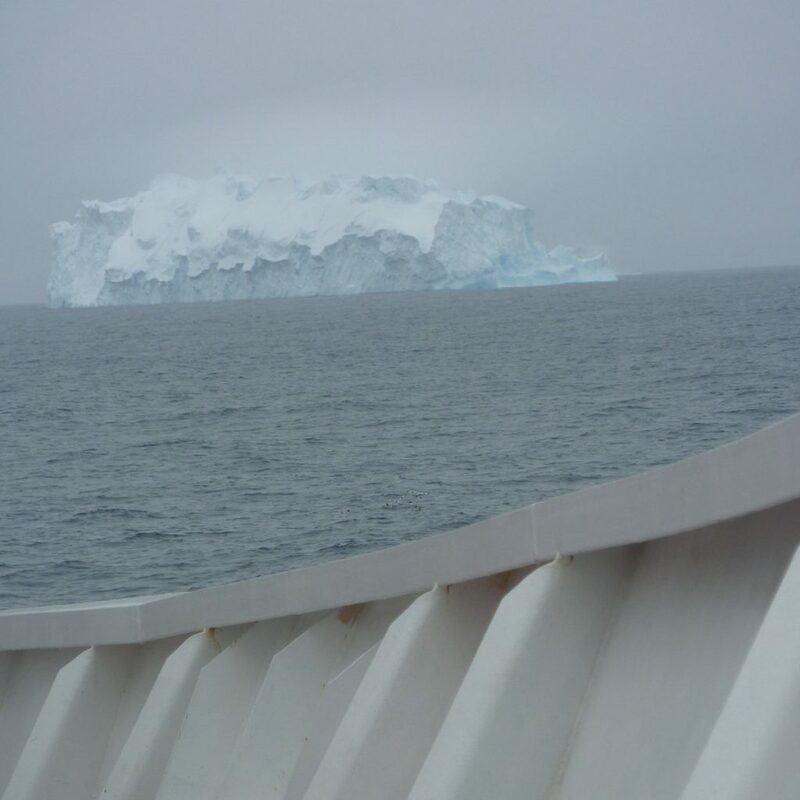 It is here out at sea that we see the remains of the day of the story of the ice from the glaciers that lies less than 100 km from our location. Once reaching the sea, without the warmth from the air that could melt them, they extend out into the sea, where with the unrelenting forces of crashing waves and the warming provided by the water large, sometimes island size, pieces of the ice sheet break off and begin the last portion of their return journey to the sea. Currents then slowly bring the icebergs out to sea and into our view to see and admire.